FORTIFIED WITH FATIGUE FIGHTING Alpha K.I.C. LOADED WITH 7 FORMS OF ANABOLIC SUPPORT B3, B6, B9 & B12! It's one thing to talk about getting more BCAAs, it's another thing to actually do – with CONSISTENCY! To get serious, you must commit to taking the right amount BCAAs every time you train (or more). So, why is this so difficult? Getting these notoriously difficult to mix (and to drink) BCAAs into your system effectively and efficiently has always been a massive barrier. Old-school non-instantized BCAAs without the MYOTRISOL™ process are messy, clump up, don't mix and worst of all leave a hideous oil-like film on the surface. Worst of all they taste bad. Taste, convenience and mixability issues turned all but the most determined and taste-bud challenged bodybuilders off BCAAs completely. Most supplements answered this by simply supplying less BCAAs in the cheaper 2:1:1 ratio. 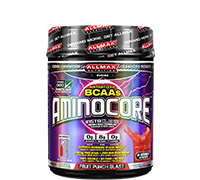 AMINOCORE BCAAs to the Rescue! 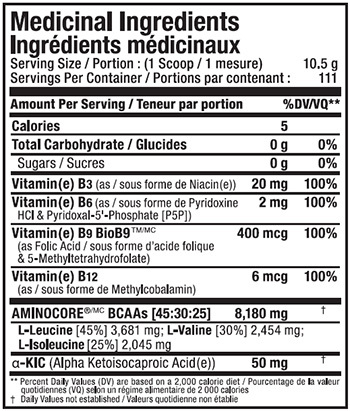 The research directed dosage of 8,180 mg of all 3 BCAAs in a precise scientifically validated 45% L-Leucine : 30% L-Valine : 25% L-Isoleucine ratio. A full spectrum of 7 completely unique and powerful forms of protein-synthesis supporting and cellular-energy releasing B3, B6, B9 and B12 Vitamins. Why do top bodybuilders and athletes swear by BCAAs? Stimulates protein synthesis in skeletal muscle for enhanced lean mass accumulation. Spares muscle-fuel stores for improved performance and endurance. Boosts your immune system during intense exercise. Reduces muscle breakdown (powerful anti-catabolic effects)*. Along with dieting, BCAAs can help you tap into fat stores while hanging on to hard-earned muscle. Serves as a fuel source during prolonged exercise when glycogen stores have been depleted (a fact that makes these Aminos unique). Humans must consume BCAAs, unlike other Amino Acids, we cannot make these on our own. A full 33% of Skeletal Muscle is comprised of Branched Chain Amino Acids. BCAAs are the only Amino Acids used directly as fuel by your muscles. Directions: To activate protein synthesis and increase muscle recovery, take 1 scoop of Aminocore durning weight training or any athletic event. On non-training days, Aminocore can be taken anytime on an empty stomach. Mix 1 scoop into a 16.9oz/500ml bottle of water or a tall glass of water. Shake or stir well. Take durning workouts.